On one of my Saturday Shopping days (yes, it happens that much that I gave it a name) I went to our local shopping centre and decided to take a quick visit into a shop called Home Sense. Now this store has only recently come to our shopping centre and before I had never even heard of it but basically they sell really unique and "out there" sort of things for everywhere around the home. On one of our visits they were selling a full suit of armor. Yep. Normally when I go shopping in Home Sense, I never find anything I like and will normally leave as soon as I get in but as soon as I saw this picture I knew I had to have it! 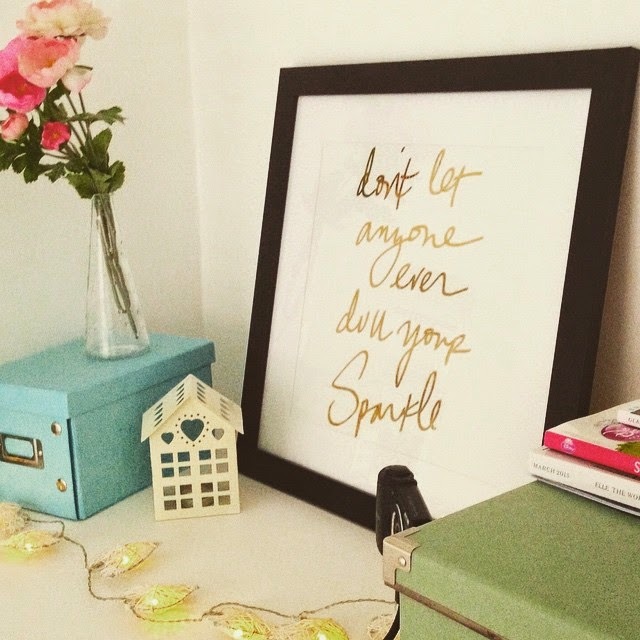 It's a square frame with a mount with just a simple quote in a gold metallic cursive font saying "don't let anyone ever dull your sparkle" and it was an absolute bargain for only £15.99! Of course I thought the quote is very motivational and I thought that the perfect place for it to go would be right next to my desk so when I'm blogging and feel a bit down or insecure about it, I can always look up at it and know to stay positive and keep going! Do you have anything on your desk that makes you happy? At first I thought you wrote it yourself and I was like WOW this girl has some real nice handwriting! I agree, sparkle on! I remind myself how incredibly lucky I am and that motivates me! Wow, it is so beautiful. Motivational and stunning, I wish we would have something like that in our town. Do you know if I can order it anywhere? Love the look of gold foil prints, I need one!